GBP/USD was unable to take full advantage of the Fed’s dovish decision as Brexit remains in the air. Eight days to the official exit date and UK PM May blamed MPs for the mayhem as she asked for a short extension. However, the technical picture remains favorable to the bulls. The Technical Confluences Indicator shows that cable enjoys a considerable cushion at 1.3217 where we see the convergence of the Simple Moving Average 100-15m, the SMA 10-1h, the Fibonacci 23.6% one-month, the Bollinger Band 15min-Middle, the previous 4h-low, the BB 15min-Lower, the SMA 5-4h, and the SMA 50-15m. The next support line is significantly lower, but still quite substantial. 1.3135 is the confluence of the Fibonacci 38.2% one-month, the Pivot Point one-day Support 1, and the Fibonacci 61.8% one-week. Looking up, resistance is much weaker than the support lines mentioned above. 1.3286 is the first hurdle, where we see the meeting point of the previous daily high and the Fibonacci 23.6% one-week. 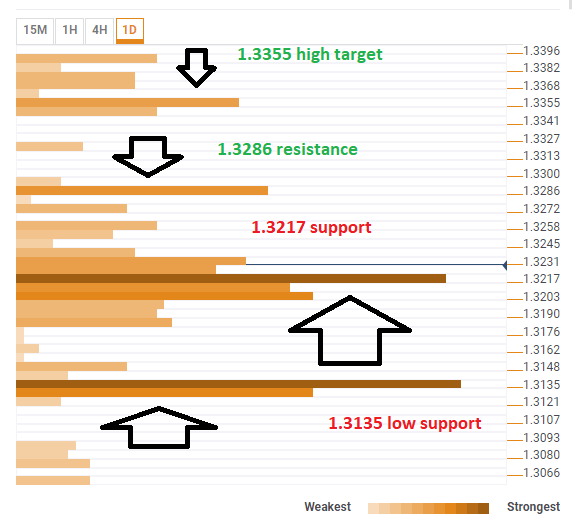 The high target for the pound is 1.3355 which is where the Pivot Point one-day R2 and the previous monthly high converge.